Atlanta’s downtown is becoming a major destination for those looking to explore Atlanta with kids. 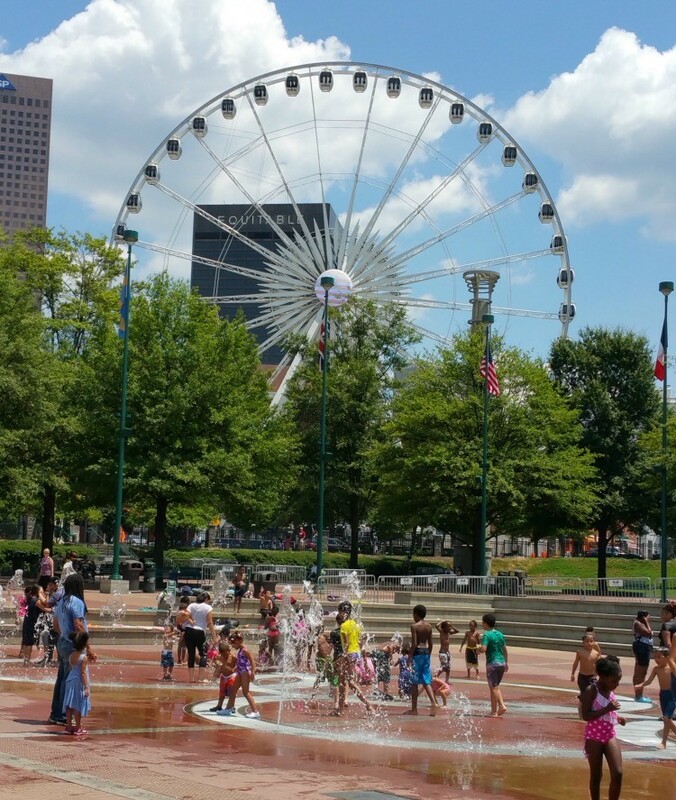 Centered around Centennial Olympic Park are fun things to do that will entertain toddlers to teens. Here are our nine recommendations, and best of all, these are all within walking distance of each other. 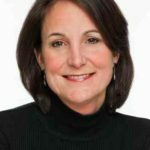 Planning to visit Atlanta with kids? Whether you are bringing toddlers or teens, there is a lot of fun to be found. We’ve broken it down for you, so you don’t miss the best attractions for your kids. The Georgia Aquarium is one of the most popular attractions in Atlanta with kids, and a must see for anyone visiting the city for the first time. 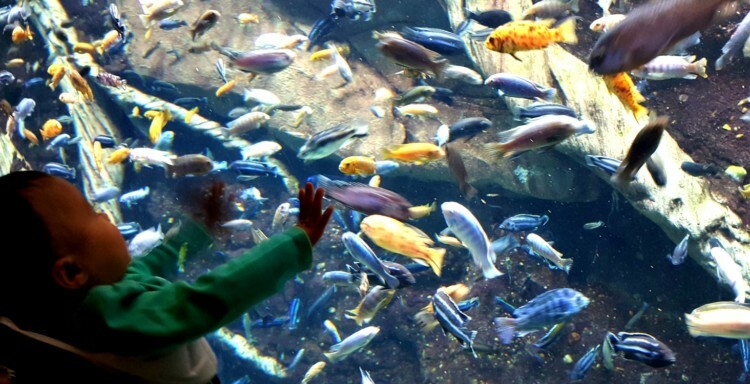 Smaller children will enjoy the many tunnels and nooks located throughout the aquarium. Get ‘in’ the penguin exhibit, watch piranhas from a ‘secret’ peep hole. Older children may want to go behind the scenes and view the awesome fish tanks from the inside. For the truly adventurous teen, you can even swim with the giant whale sharks at the Georgia Aquarium. 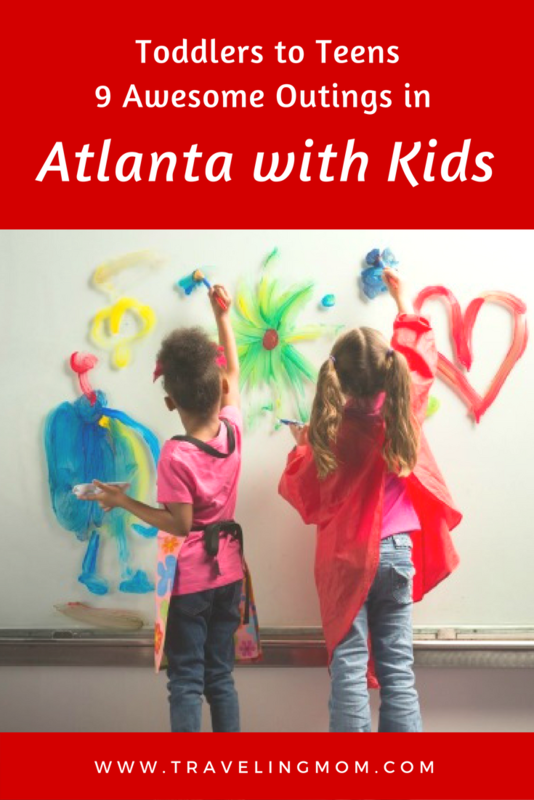 The Children’s Museum of Atlanta is an awesome indoor playground for kids 12 and under. CMA received a MAJOR overhaul in 2016, so now it’s even better than before. 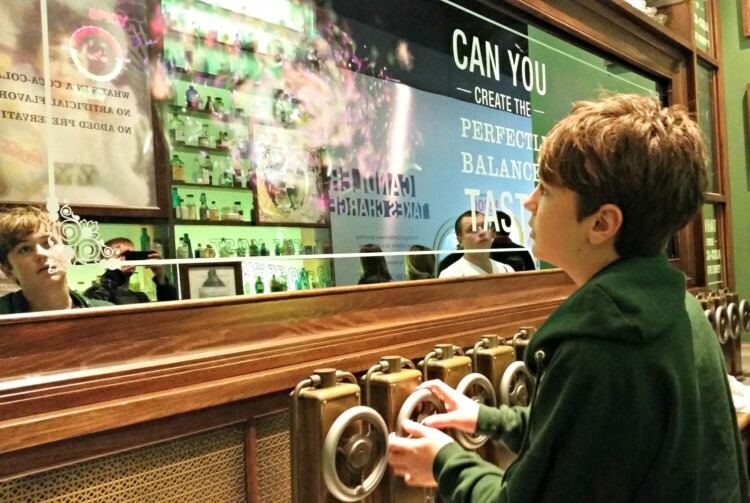 Popular exhibits like the Tools for Solutions crane where kids use pulleys to move colorful balls, is still there, but they’ve also added a Build it Lab for older kids where those six and up can use real tools! Younger visitors to the Children’s Museum of Atlanta may want to plan a visit on select Monday’s for Tiny Club Mondays. Kids 2 – 5 can enjoy a 30-minute class designed specifically for them. 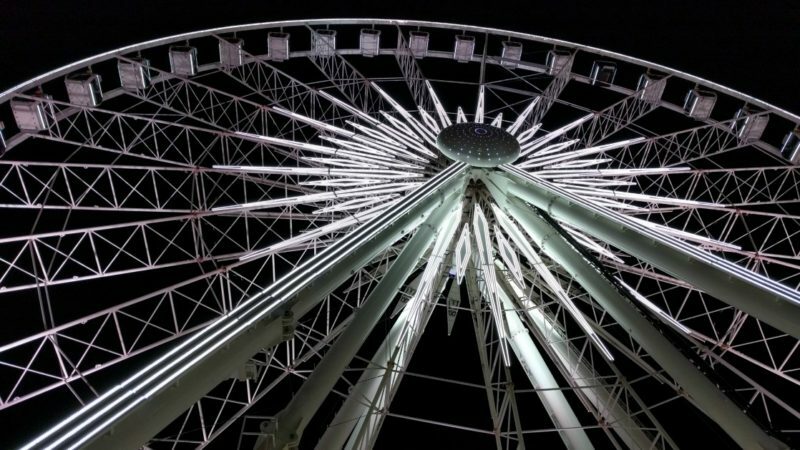 Teens will love SkyView Atlanta, a giant ferris wheel that gives you a birds eye view of Centennial Olympic Park, as well as all of Downtown Atlanta. 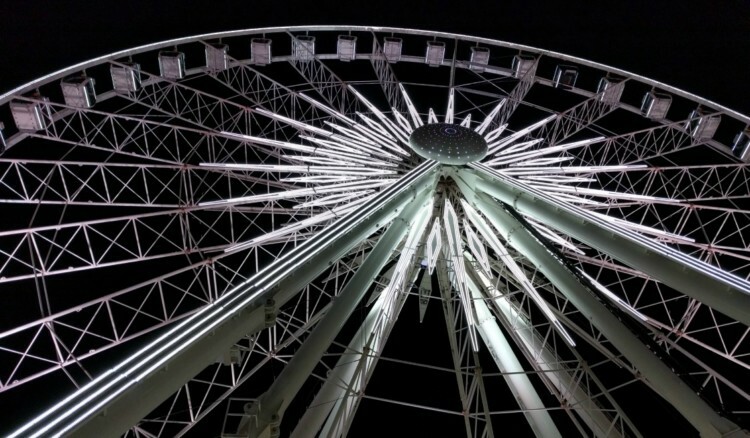 Go up in the Atlanta Ferris Wheel in the evening for an especially beautiful view when all the park lights are glowing. Younger children are welcome too, you ride in a gondola type cab, but it does go high, so make sure they aren’t scared of heights first. Built for the 1996 Centennial Olympic Games that were held in Atlanta, Centennial Park the center of the Downtown attraction district. In summer bring a bathing suit and towel. Kids of all ages like to cool off in the Fountains. During the holidays, you can ice skate, see Holiday Lights, or witness the new Chinese Lantern Festival. Everyone, no matter what the age, loves a good burger joint. Take a break while exploring Centennial Olympic Park for a burger and fries made from scratch at Googie Burger. The amazing hand cut fries are only surpassed by their delicious milkshakes. Try the Googie Peach or the Coca-Cola Float. Note that Googie Burger shuts down in the winter, so you’ll have to enjoy their awesomeness after May 19, but don’t worry, Downtown Atlanta has several other restaurants located around the park like Kwan’s Deli and Korean Kitchen. Ever wonder how the news is produced? Older elementary through high school kids will like getting a behind the scenes look at the Cable News Network which was started in Atlanta. Depending on when you go, you can actually see them producing the newscasts. My 8-year-old’s favorite part was learning how a green screen works and disappearing behind it just like Harry Potter’s invisibility cloak. Atlanta is home to the soda giant Coca-Cola. The world-wide corporate headquarters is located in Midtown, but downtown you’ll find the World of Coca-Cola museum. Little ones will love cozying up to the larger than life Coca-Cola Polar Bear (at least if they like costumed characters). Tweens will want to try all the flavors of Coca-Cola products in the tasting room, don’t let them sucker you into trying the Beverly. Teens will enjoy shopping for unique branded items in the World of Coca-Cola gift shop. My favorite was a purse made entirely of can pop-tops. 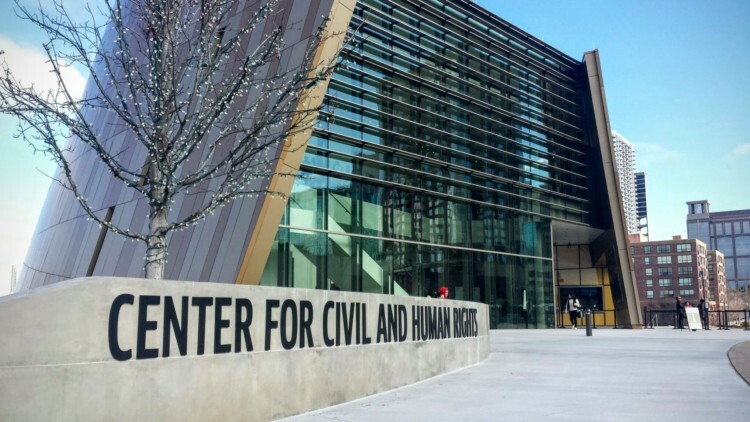 This Center for Civil and Human Rights is the latest addition Downtown Atlanta, and it is very powerful. Although teens and tweens will likely get the most out of the museum, elementary school children can also learn quite a bit too. I would not recommend this for preschool and younger kids. The Center for Civil and Human Rights is a fantastic museum to start a discussion about both the civil rights era in America and the larger issue of human rights around the world. Interactive elements like the lunch counter, where guests become protestors. They put on headphones to hear the jeers and taunts as they must sit quietly hands on the counter. Guest can also walk on the balcony of the Lorraine Motel, the site of Martin Luther King’s assassination. These exhibits really bring it home for anyone that visits. You don’t have to be a huge football fan to enjoy the College Football Hall of Fame, but if you are, even better. See if you can find your team in the three-story atrium with 760 football helmets from all different colleges. My teens favorite part of the College Football Hall of Fame was throwing passes in the Chick-fil-A Peach Bowl Skill Zone. The 10-year-old liked creating his own mascot. I enjoyed the tailgate exhibit, and the look at sports psychology. We found my husband watching the most memorable college football plays complete with commentary from the day – cheers and all.